Pep Llambias, ‘RITUAL’, 2018. Neon light, wood, aluminium, 70 x 140 x 11cm. Electric Poetry – The “word & verse” sculptures of Pep Llambias, are fashioned from steel, wood, stone and light. Their undeniably romantic nature becomes a trigger for the viewer that sets our minds free in pursuit of an idea, a feeling, an illusion, a dream. That such a range of metaphorical journeys are encouraged by a familiar font. 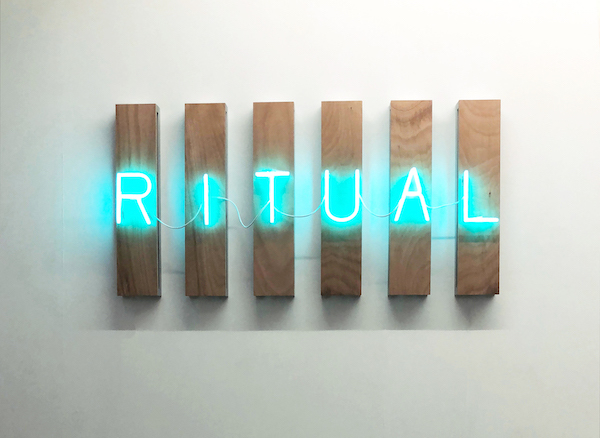 Crafted in plywood and steel or shaped in neon, speaks to the mysteries of language. Through the seduction of sound and the joy found in colour and light, the pieces are set free to float on a gentle updraft of poetry and vision.